I have been slacking on reading a little bit this month, but I also have been reading stuff that is a little bit longer. Everything that I read in May was pretty good, but nothing was my favorite. I still hold by my method of reading one paper book, and listening to one audiobook at a time. I find it so much easier to listen to audiobooks, because I can do it while I’m working, cooking, cleaning, etc. Once again I am linking up with Puppies and Pretties for Reading, Lately. Thousands of miles away from the small township of 'Salem's Lot, two terrified people, a man and a boy, still share the secrets of those clapboard houses and tree-lined streets. They must return to 'Salem's Lot for a final confrontation with the unspeakable evil that lives on in the town. 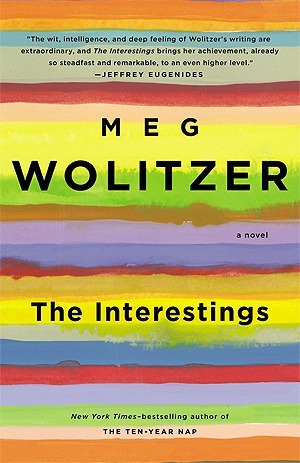 After I read 11/22/63 last month, this was recommended to me by a co-worker. This is one of Stephen King’s earlier novels, and even though it does fit the mystical/horror/scary genre, it is a little bit kitschy. It is set in the early 70s, and you can SO tell that that affects the plot. Stephen King narrates the forward, and he says that if he could change one thing about this novel, it would to be not placing it in such a specific time. In 1916, French artist Edouard Lefevre leaves his wife Sophie to fight at the Front. When her town falls into German hands, his portrait of Sophie stirs the heart of the local Kommandant and causes her to risk everything - her family, reputation and life—in the hope of seeing her true love one last time. Nearly a century later and Sophie's portrait is given to Liv by her young husband shortly before his sudden death. Its beauty speaks of their short life together, but when the painting's dark and passion-torn history is revealed, Liv discovers that the first spark of love she has felt since she lost him is threatened… In The Girl You Left Behind two young women, separated by a century, are united in their determination to fight for the thing they love most—whatever the cost. I love Jojo Moyes, and I’m so excited to see Me Before You in theatres. I was actually surprised that this is a historical novel, after Me Before You was set in present time. I liked the plot and the premise, but it felt a little bit like Moyes was getting to the end, and then rushed through the ending. I would have liked to see this book be a little longer, and the ending more developed. A cozy collection of heirloom-quality recipes for pies, cakes, tarts, ice cream, preserves, and other sweet treats that cherishes the fruit of every season. Celebrate the luscious fruits of every season with this stunning collection of heirloom-quality recipes for pies, cakes, tarts, ice cream, preserves, and other sweet treats. Summer's wild raspberries become Raspberry Pink Peppercorn Sorbet, ruby red rhubarb is roasted to adorn a pavlova, juicy apricots and berries are baked into galettes with saffron sugar, and winter's bright citrus fruits shine in Blood Orange Donuts and Tangerine Cream Pie. Yossy Arefi’s recipes showcase what's fresh and vibrant any time of year by enhancing the enticing sweetness of fruits with bold flavors like rose and orange flower water inspired by her Iranian heritage, bittersweet chocolate and cacao nibs, and whole-grain flours like rye and spelt. Accompanied by gorgeous, evocative photography, Sweeter off the Vine is a must-have for aspiring bakers and home cooks of all abilities. Sweeter off the Vine focused on fruit desserts, which I thought would be perfect for the upcoming summer. It focuses on using fresh ingredients, all year long. Arefi is a blogger, and the photos included in this cookbook are amazing. I will certainly be trying my hand at some of these recipes this summer! **I received this book for review from Blogging for Books. Everyone always uses Angela’s Ashes as an example of a depressing story. I think what made it even more depressing is that Frank McCourt read the audiobook himself for the recording. Hearing stories like this make me feel so fortunate to have the upbringing and circumstances I did. 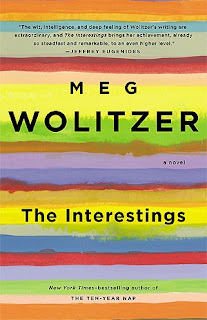 I am still reading The Interestings by Meg Wolitzer. I hope I can really start to plow through it during my flight home to Norfolk on Tuesday. 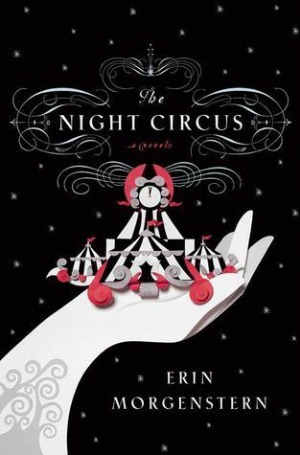 Up next in my Audible library is The Night Circus by Erin Morgenstern. Does anyone have any good recommendations for me? Also, do you have any tips on playing audio books through my phone, without using Audible? Are you following me on Goodreads? 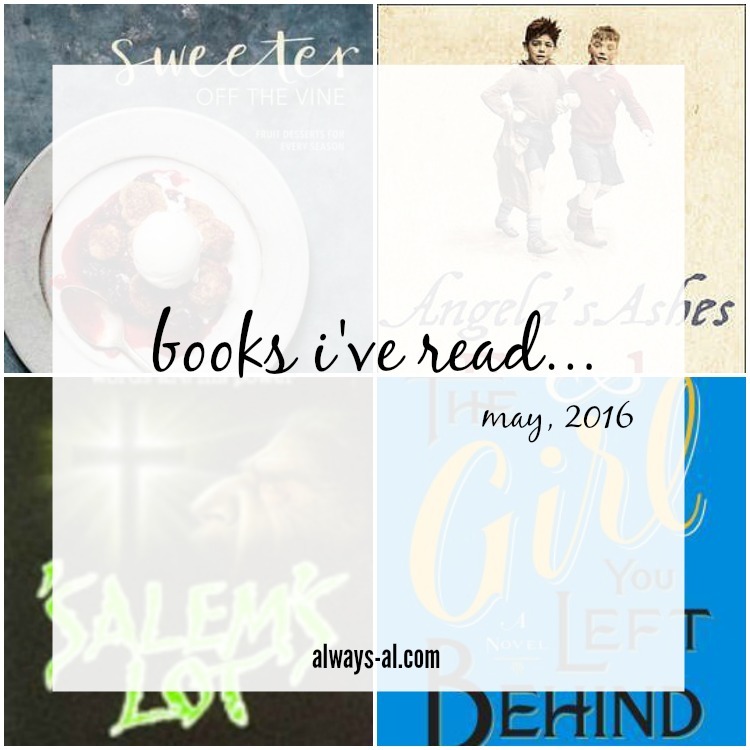 Keep up with what I’m reading!